From outdoor adventure to family fun to date nights, St. Charles, Missouri is full of reasons to visit! Located on the Missouri River northwest of St. Louis, St. Charles rewards its guests with a unique fusion of past and present. Founded some 250 years ago, this vibrant community flourishes around the authentic ambiance of its Main Street Historic District, restored and maintained by local residents dedicated to preserving the town's river heritage. For history buffs, foodies and savvy shoppers alike, St. Charles is a can't-miss experience enjoyed by more than a million visitors annually. Here are 10 reasons to put St. Charles on your bucket list. Little Hills Winery produces a variety of wines designed to complement the classic American cuisine offered in its vintage Main Street restaurant. With live music on weekends and a tiered patio dotted with cozy fire pits, Little Hills Restaurant was named the "Best Place to Take a Date" by St. Louis voters. Sugar Creek Winery & Vineyards, with hillside vineyards overlooking the Missouri River Valley, is a popular way station for bicyclists and hikers traveling the Katy Trail. Located in nearby Defiance, Sugar Creek is a favored stop for wine lovers on the Missouri Weinstrasse tour. Visit either of these accomplished vintners to discover why wineries in Missouri are rated among the nation&apos;s best. Upon Missouri&apos;s admittance to the Union in 1821, St. Charles served as the new state&apos;s first seat of government until a permanent capital city was established in Jefferson City five years later. That first capitol building stands on Main Street today as an enduring testament to the vital role St. Charles played in Missouri&apos;s emergence as the Gateway to the West. A guided tour of the restored Federal-style brick building&apos;s 11 rooms evokes an appreciation for the challenges those first legislators faced when St. Charles was at the far edge of civilization and the West was truly wild. 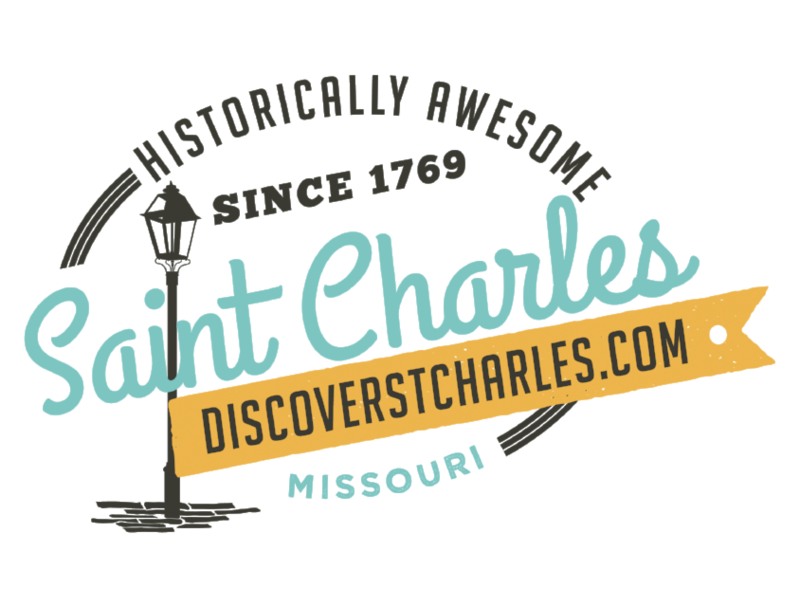 Long before Missouri attained statehood, St. Charles was an important supply point for the steamboat trade and the earliest westbound adventurers. Today, the same buildings where those early travelers bartered and bragged offer a cornucopia of shops and boutiques, each one as unique as the owners who created them. Wares range from clothing, antiques, books, custom furniture and unique specialty items to jewelry, original art, period costume photography, home decor and a rainbow of surprise one-of-a-kind finds. Shopping along the brick-lined streets of St. Charles&apos; 14-block Nationally Registered Historic District becomes a fun-filled expedition you&apos;ll never find at the mall. For art lovers, Missouri Artists on Main and Foundry Art Centre are must-sees. The two-story Missouri Artists on Main gallery, built 200 years ago as a stagecoach station, exhibits and sells the works of nearly 50 award-winning artists from across Missouri. Offerings include paintings, ceramics, photography, jewelry, mixed media, sculpture, vintage clothing, folk art and more. The Foundry Art Centre occupies another historic venue-a renovated train car factory from the 1920s-and encourages public participation in an effort to bring people and the arts together through exhibitions, open artist studios to see creators at work, live performances and education. With so many active, creative talents at work, new treasures are always waiting to be found. Recognized as St. Charles&apos; Retailer of the Year for 2015, Missouri Artists on Main is open seven days a week, and the Foundry is only closed Mondays. With more than 25 eateries to choose from, no appetite goes unconquered on Historic Main Street, where the tantalizing aromas from an old-style bakery may whet your culinary imagination as you peruse the district&apos;s wonderland of cafés, public houses and intimate restaurants. Italian, French, German, Mexican, award-winning barbecue-you&apos;ll find your preferred cuisine among St. Charles&apos; restaurants. Whether you enjoy your meal al fresco in a patio setting, elegant dining room, coffee house or local pub, you&apos;ll be met with a friendly welcome that says to one and all, bon appétit! When Lewis and Clark embarked from St. Charles on their epic journey of discovery in 1804, the frontier town was the last civilized outpost before entering a vast untamed territory. The Lewis & Clark Boat House and Museumcommemorates that pioneering adventure with full-scale replicas of their keelboat and pirogues, a National Geographic video (enhanced by a magnificent diorama) illustrating the expedition&apos;s entire 7,000-mile journey, informative artifact exhibits and a gift shop specializing in Native American artwork. Frontier Park is next door, where a larger-than-life 15-foot tall bronze sculpture of Lewis, Clark and Seaman, their enormous Newfoundland dog, provides one of the District&apos;s most popular photo opportunities. Named after the old MKT Railroad, the Katy Trail is a crown jewel in the Missouri State Parks system. Running alongside the Missouri River for much of its 240-mile length, the Katy&apos;s scenic, level path is a favorite with bicyclists, hikers and joggers. The trail runs near historic Main Street, giving visitors the opportunity to stretch their legs and take in views of the big river as it flows by Pioneer Park. For those who want to venture a bit farther, the Bike Stop Café & Outpost, located right beside the trail, provides a shuttle service and bike rentals, including a limited selection of bikes for children. Dip into another great chapter of American history with a visit to Fast Lane Classic Cars. Here you can browse through cool automotive collectibles while inspecting an ever-changing inventory of iconic American rides, from 1930s classics and 1950s status symbols to muscle cars of the 1960s, &apos;70s, and beyond. While a tour of their four-building operation is like stepping back in time, Fast Lane Classic Cars isn&apos;t a museum. They&apos;re in the business of locating, restoring and selling the landmark vehicles that have played starring roles in America&apos;s great love affair with the automobile. And who knows, you just might find the car of your dreams. Ameristar Casino Resort Spa, with its soaring tower of luxurious suites, anchors the western edge of the Main Street Historic District. Its 130,000-square-foot casino features the very latest in electronic and table games, plus a live poker room. Visitors enter the Ameristar complex via a grand entrance that adjoins a streetscape loaded with restaurants, entertainment venues and elite Ara Spa services for men and women. For elegant dining, trying your luck or unwinding in style, Ameristar is one of St. Charles&apos; most popular destinations. St. Charles hosts a colorful spectrum of festivals and special events throughout the year. Music on Main, a free outdoor concert series (bring your lawn chairs), features popular musical acts on the third Wednesday of each month in season, while Oktoberfest celebrates the city&apos;s historic German influence. During Main Street&apos;s month-long Christmas Traditions celebration, more than 30 costumed Legends of Christmas stroll the streets greeting guests and Victorian carolers evoke the Christmas spirit with old-fashioned noels, while the shops, restaurants and other Main Street Historic District establishments add Yuletide warmth with glittering decorations and seasonal displays. Check the calendar of events to incorporate these or several other annual events in your plans. Whatever your pleasure during your visit, the most memorable highlight may come when you realize you&apos;ve stepped into a continuum of history that directly connects present day life with the great tide of early 19th century opportunists who flooded Main Street on their way to the vast lands of the Louisiana Purchase. With a friendly welcome from today&apos;s residents, you&apos;re invited to join that long line of intrepid pioneers and create your own journey of discovery in historic St. Charles. Bon voyage! Visit St. Charles and you&apos;ll never run out of things to do.